The neck guides are manufactured from machined stainless steel bar which is a material not affected by heat, indestructible and not possible to cut with a knife (as plastic neck runners are), not subject to dirt build up and easy to clean. Using stainless steel bar materials means that the joins of the neck guides uses a clever system of micro adjustment to ensure that there is a perfect transition from one set of neck guides to the next. 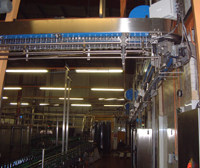 Airflow from the fans is blown onto the shoulders of the bottle rather than inside reducing the possibility for contamination. The fans can be inverter controlled or controlled by a simple fixed damper at the fan suction. Easy open plastic covers on the stainless steel chamber ensure easy cleaning and higher hygiene for the empty bottle. The 90o corners are manufactured on a patented minimum radius bend that obviates the need to adjust the side guides. 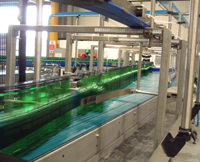 On adjustment, Enterprise Tondelli Spa, have designed a simple quadrant adjustment that allows a 3-metre long side guide to be moved on one single adjustment. Of course fully automatic infinitely adjustable “future proof” guides are available both longitudinally and latitudinal quick change over neck support system utilising mini-motors and rack and pinion technology. Typically used for containers with flat bases such as Polybottles in the dairy industry. 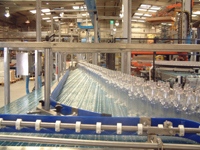 This can be used on dual purpose lines where both glass and PET bottles are to be handled making it very versatile. For instance as part of a high speed can conveyor system we would fit vacuum bridge for damaged flange rejection..